Some slamming 1978 Disco HEAT from the Salsoul stable! 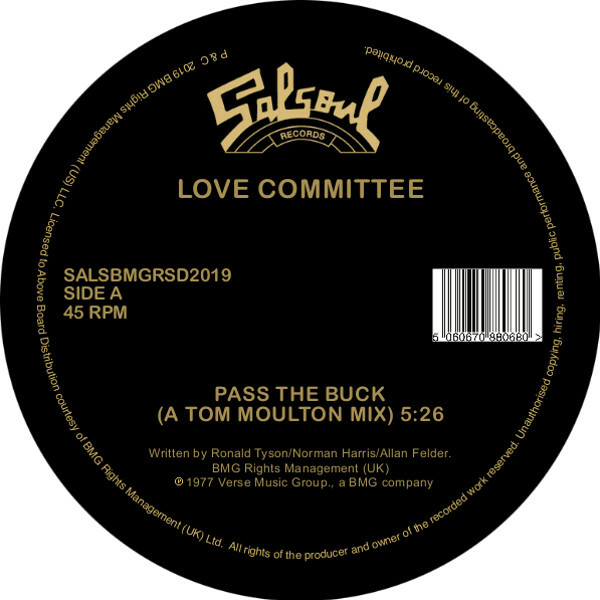 'Pass The Buck' is a very popular LP cut from the group's sole long player 'Law & Order', naturally any Tom Moulton mix from that period is well worth your ears and your time if you consider yourself a Disco lover, the man's hands were all over a ton of classics and he had the magic touch for real. 'Pass The Buck' has all the hallmarks of the bombastic 'Philly Sound', arranged by the legendary Ron 'Have mercy' Kersey and his team and mixed by Moulton, this blast of FUNK opens side B of said long player. Mysteriously never released as a 12", this is one TM mix that really benefits from a nice loud pressing as it is presented here on this special RSD 19 12" reissue. That's not all, throw in a super, extended, cosmically overdubbed and tweaked re-edit from NYC's master of such disciplines - Joe Claussell - and we're talking some serious business, right? Well, that's what you get on this special limited release, the full 9+ minutes of Joe's very special reinterpretation, this one's all killer and no filler. Spiritual Discofied-Funk straight outta NYC for your enjoyment! Fully licensed, sanctioned and released by Above Board distribution and Salsoul Records. Accept no imitations!